Picking up the story three years after Mike bowed out of the stripper life at the top of his game, 'Magic Mike XXL' finds the remaining Kings of Tampa likewise ready to throw in the towel. But they want to do it their way: burning down the house in one last blow-out performance in Myrtle Beach, and with legendary headliner Magic Mike sharing the spotlight with them. 'Magic Mike XXL' features an all-star cast including Channing Tatum, Joe Manganiello, Alex Pettyfer, Matt Bomer, Jada Pinkett Smith, Adam Rodriguez, Donald Glover, Elizabeth Banks, Amber Heard, Kevin Nash and Gabriel Iglesias. The 'Magic Mike XXL' competition has now closed. Winners will be announced shortly. Competition opens at 5pm AEDT on Sunday 18th October 2015 and closes at 11:59pm AEDT on Sunday 25th October 2015. Five winners will be chosen at random on Monday 26th October 2015. To successfully win, entrants must fulfil the above entry conditions before the time the competition closes. Current members/followers are eligible to enter the competition. Only one entry per person. Only one winner per household. To be a valid winner, the entrant must not have won a prize from SWITCH within the last 28 days. Each winner will receive one Ultraviolet Blu-ray copy of 'Magic Mike XXL'. By entering, you agree to receive occasional emails from SWITCH in the future. If you decide to unsubscribe from these updates, any further entries will not be applicable. Only Australian residents are eligible to enter. 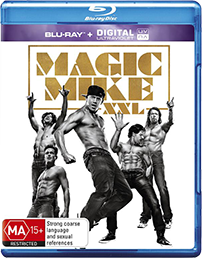 'Magic Mike XXL' is available on Digital, DVD and Ultraviolet Blu-ray on Wednesday the 21st October 2015 from Roadshow.